This is an example sentence.² With a second sentence added. In most cases the above sentences will be imported to CAT tools as a single segment, which will require manual splitting to achieve correct leverage in TM. Fortunately there is a simple solution for this problem. A frustrated friend recently posted about this problem on Twitter, and when I asked for details of her problem, she sent me a sample file with lots and lots of references, asking if it’s possible to create segmentation rules, which would segment such text correctly. It came out to be quite simple matter, and since the problem may be more widespread, I thought I should make the rule public. 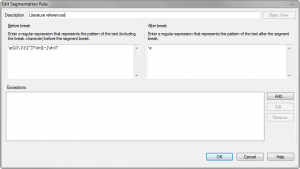 Below you’ll find instructions on how to add segmentation rule for memoQ and Trados Studio. In memoQ segmentation rules are separate resources. There are always default segmentation rules for a given source language, but you can create your own rules used only in particular project. In the procedure below I’ll describe how to copy default rules for English and how to make it default for new projects in memoQ 2014 R2. From the Language drop-down select English (or English variant, or any other source language you need this rule for). Click Create new command in the lower part of the window. Enter name for the new rule set, e.g. Default with references. New rule set will contain a copy of default settings. Select new rule and click Edit. Click Advanced view in the lower left corner of the dialog (if you have memoQ older than 2014 R2, simply skip this step). Click OK and Close, to close the resource console. Click Options icon (for older memoQ versions: Tools > Options) to display Options dialog. In the Default resources field and Segmentation rules category use Language drop-down to select English (or any other language you’ve edited). Check the option field next to newly created segmentation rules (e.g. Default with references). New projects will use this segmentation rules for selected source language. Go to Translation Memory View. Click on File > Open > Open Translation Memory to add the translation memory you wish to change to the list of translation memories. Right-click on the listed translation memory and select Settings from the menu; this opens the Translation Memory Settings dialog box. On the right-hand side highlight Segmentation Rules and press Edit. 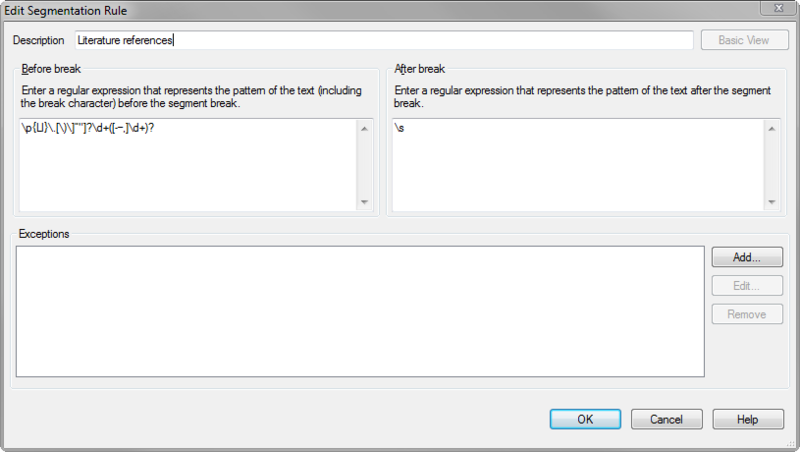 In the Segmentation Rules dialog box, click Add to open the Add Segmentation Rule dialog box. Enter for example Literature references in the Description field. Click OK several times to confirm the changes until you are back in the Translation Memory View. Please note that when I was editing the rule in Studio I’ve encountered a peculiar bug: any file was segmented correctly only on the second try, that is, if you add the rules to your TM and the file will not be segmented correctly, delete the file and import again. It should work on the second try. If the rules are not enough for you, e.g. you need rules for some special cases, please contact me, I may be able to help. Send me a sample of the text you want to segment – just several lines in the form it is currently and manually segmented the way you want, I will try to give you a solution. If you need something more fancy, contact me by email, we can talk. Above segment rules is working fine but we are facing some issue while splitting. but i want to split the segment like this. Please help me with this type of segmentation rule segment. I’m sorry Rajanikanth, but you’ve reached the quota of free work I’m willing to offer. As I’ve written previously, if you need more specific rules, contact me via email and I’ll be happy to provide segmentation rules for modest fee. 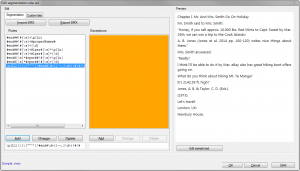 I have been looking for a way to segment Word files in German with footnotes in memoQ so that the program does not segment before footnote tags located at the end of sentences (i.e. outside the final punctuation mark). With the default segmentation rules for German, these tags appear at the beginning of the following segment, even though they “belong” to the previous segment. In files with lots of footnotes, I find this very confusing and have even begun to manually resegment texts so that the footnote tags are where they belong. As I understand your post, this is what your segmentation rule is supposed to achieve. However, it is not working for me: I added the rule following your instructions above, but it makes no difference to how texts are segmented (i.e. memoQ still splits segments before a footnote tag at the end of a sentence). I you have any suggestions about what I might be doing wrong, or if you could modify your rule to cover my situation, I would be very grateful. The rules I’ve put in the post won’t work for tags, only for actual numbers. I’m not even sure it’s possible to account for tags in segmentation. I can test it, but I would need example file. Thanks for this clarification. That does not sound too hopeful. The memoQ support people were not able to help me with this problem either. I don’t know how to send a sample file though this web site. But any Word file with “live” footnotes or endnotes, where the footnote numbers appear at the end of the sentence outside the final punctuation (i.e. the full stop) will do. This is the usual position of end of sentence footnotes in English and German. In French, by contrast, the footnotes are placed inside the final punctuation, so this problem does not arise with French Word files.